Authorities have begun arresting opponents against the Dakota Access pipeline who failed to leave a protest camp by a government-set deadline this afternoon. More than an hour after the deadline, police started arrested people who didn’t comply with the order. It’s not immediately clear how many protesters have been arrested. The U.S. Army Corps of Engineers gave demonstrators until 2 p.m. ET today to clear the Oceti Sakowin camp, which is located on federal land and nearby the Standing Rock Sioux Tribe reservation. The agency and state officials cited a spring flooding threat when the snow melts. Many of the 200 to 300 protesters peacefully vacated the camp hours earlier today, the Associated Press reported. The camp, once the base of operations for thousands of tribal leaders and their supporters, was relegated to few hundred people Wednesday. Tribal leaders challenged the construction of the four-state, 1,172-mile oil pipeline, fearing that the pipeline could contaminate Lake Oahe, a primary water source for the reservation. They also argued that tribal leaders weren’t properly consulted about the project and were concerned that the pipeline would damage cultural sites on their land. The pipeline’s builder, Energy Transfer Partners, has maintained that the pipeline was a safer option than rail and trucks to transport oil. 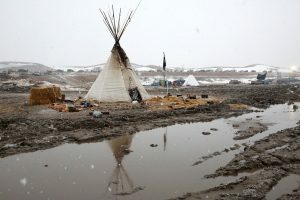 In January, President Donald Trump signed executive orders that cleared the way for the completion of the once-delayed Dakota Access pipeline. Ahead of the deadline, North Dakota Gov. Doug Burgum announced that a travel assistance center would be set up for protesters, offering personal kits, water, bus fare, a night’s worth of hotel lodging and snacks, among other services.